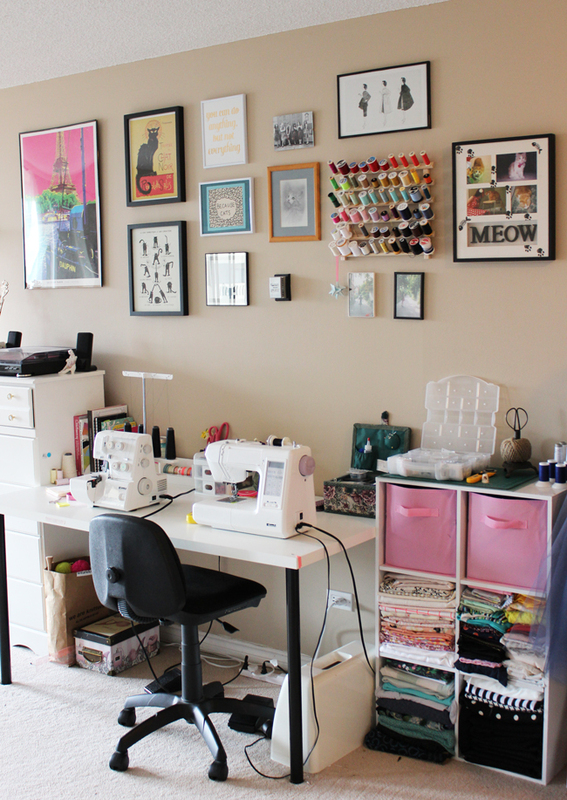 Tilly and the Buttons: Sewing Space Tours... Katryna's Inspirational Space! 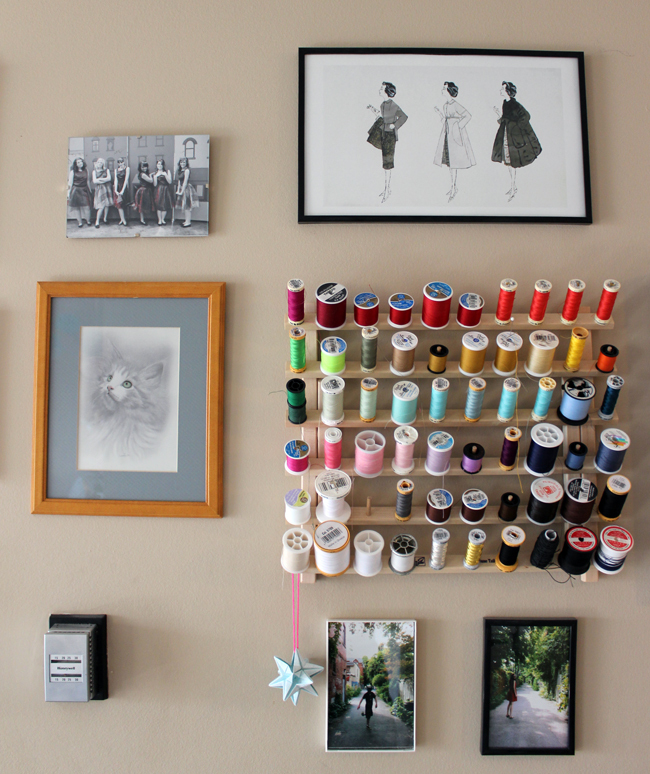 Sewing Space Tours... Katryna's Inspirational Space! 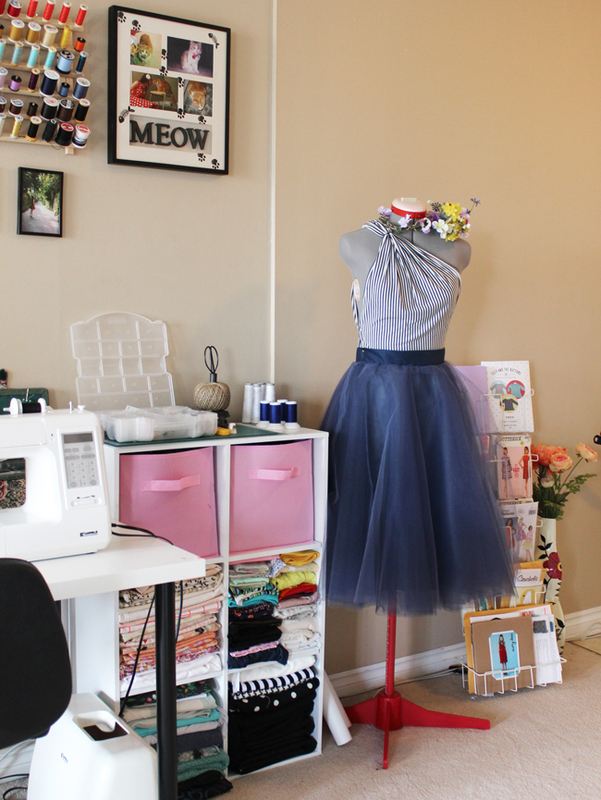 Time for another peek into an inspirational sewing space! 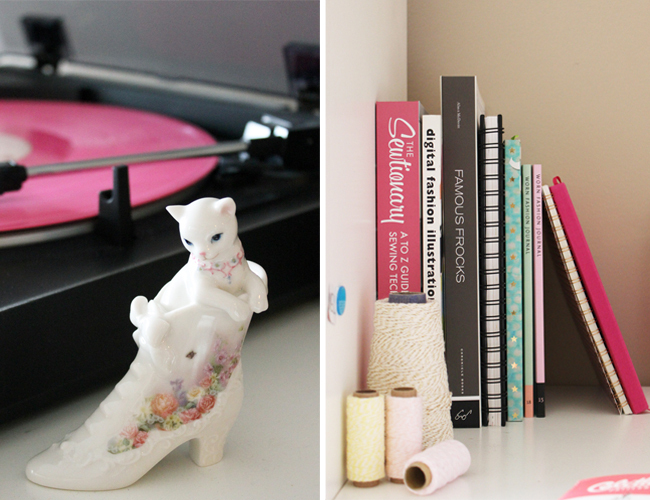 Today, we're heading to Canada to meet Katryna, and hear about her fantastically feline space. Take it away, Katryna! Hello! 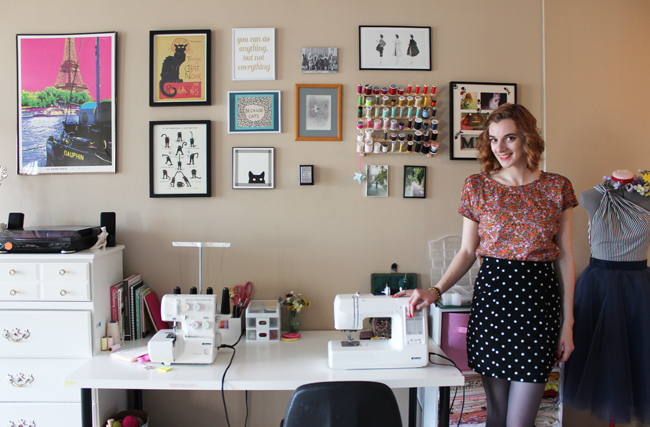 I'm Katryna and I am thrilled to share my sewing space with you today. 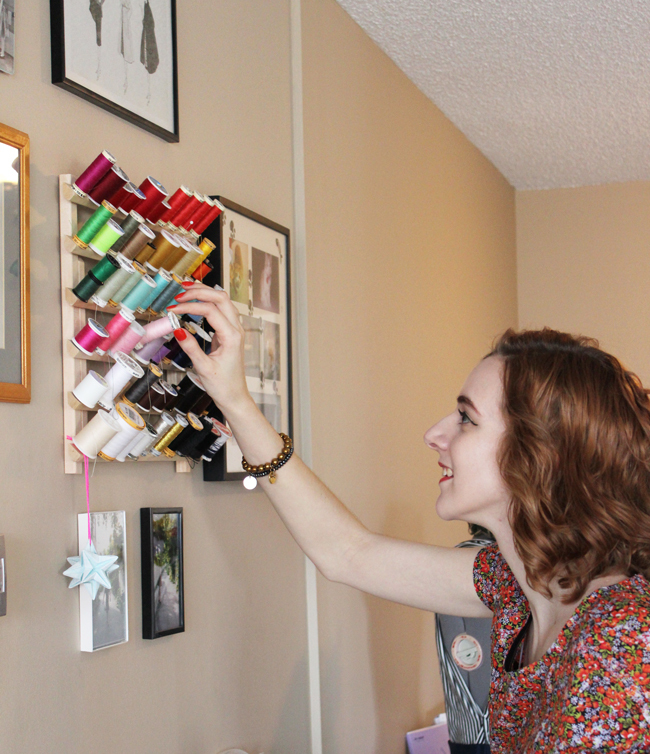 I live in Western Canada and I have been sewing for almost 14 years. My grandmother taught me to sew during summer vacations, and I dabbled on and off for many of those years, mostly in High School Home Economic classes. I ended up taking my University degree in Human Ecology with a major in Clothing & Textiles, which took me headfirst into every aspect of clothing, from costume history to material culture, to pattern drafting and textile design. I never wanted to be a fashion designer but I found a love and connection to making my own clothing. 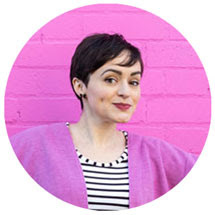 I currently work in marketing and online content for a local boutique and sew in my free time. I started out making vintage style party dresses, but once I discovered indie patterns I really got into making everyday basics and comfortable day dresses - keeping a vintage touch of course! 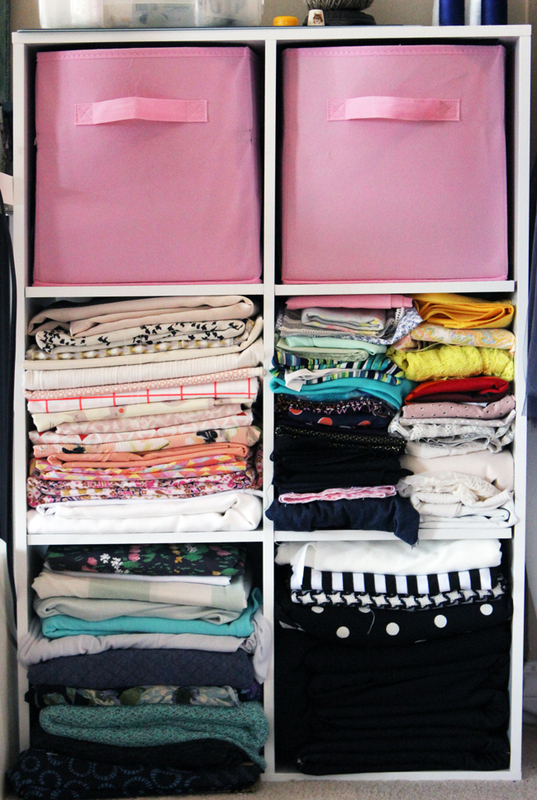 When my boyfriend and I were looking for a space, having ample room for sewing and crafting was very important. Thankfully we found this apartment with a wide open living room and lots of natural light. My space takes up nearly the full living room wall and my computer and work desk sit directly opposite it. My boyfriend has his own room for his studio space, so it was totally fine for me to completely take over this half of the apartment. 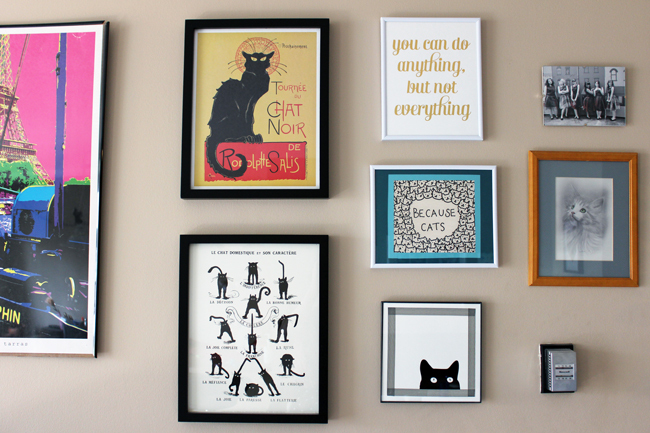 I really wanted the space to be as inspiring as it could be, so shortly after we moved in I hung up my art wall above the desk. I also crafted some paper decorations, which I like to change up seasonally. The only thing I might change if I could would be to paint the walls white! It's very hard to take progress photos when dealing with yucky beige walls! Walls aside, I wanted my space to be as bright and colourful as possible, without distracting from the details of the projects I am working on. Currently, I am finishing up a dress in a really interesting metallic knit I have been holding onto since the holidays. It almost seems too dark now that the spring sun is coming through, but I'm the type that can't start anything new before finishing what's already been started. 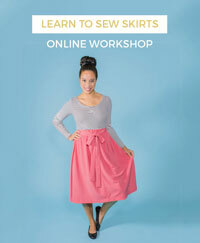 Once that is done, however, I'll move on to Tilly's new Martha dress pattern! 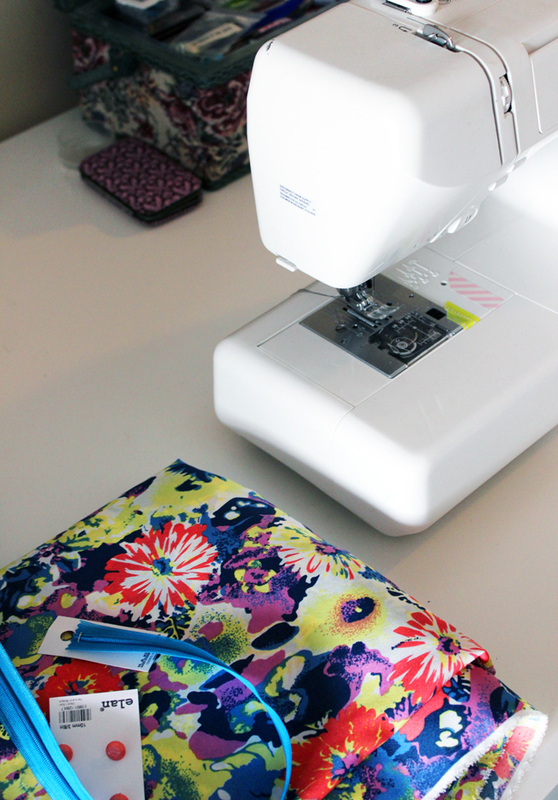 I have a bright neon floral fabric waiting for it, and it will be my big foray into Spring sewing. Spring and Summer always connote swingy skirts and light dresses, and I am also crushing hard on blush pink fabric. I may have four blush projects in queue... I have that problem, as I am sure many of us do, where my fabric buying doesn't quite compare to my sewing output, leaving me with heaps of uncut textile - but I am really determined to make my way through my plans this season! My poor fabric shelf couldn't handle it if I don't, it's actually already bursting out of the sides. Since you see it right as you walk in the door, my dress form is often dressed up. If I am not working on anything for the moment, she can be seen wearing outfits that match the spirit of whatever season we are in (as seen by the springtime fluffy skirt and floral headpiece), or wearing recently finished projects so I can admire them. 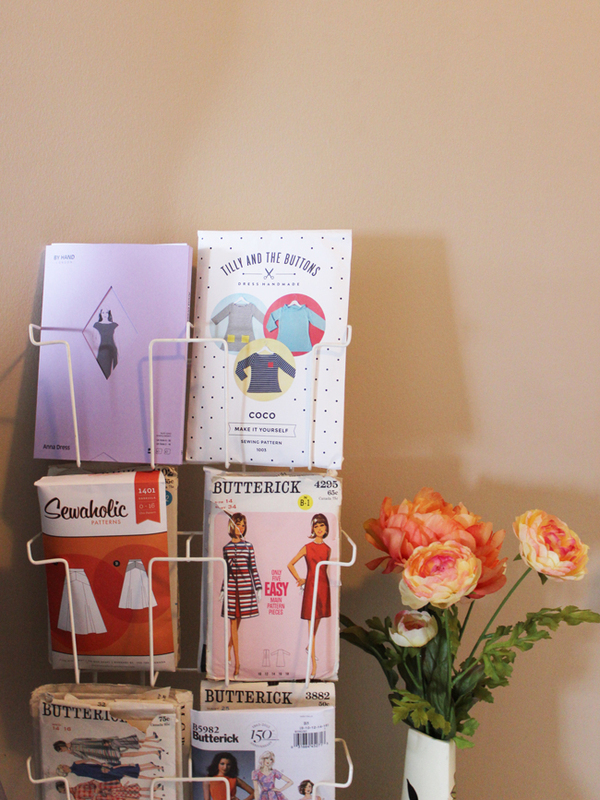 I love having my stash and pattern selection fully on display as well (shout out to my friend Nicole, who found me that brilliant pattern stand!). It makes it really easy to get excited for upcoming projects, as well as being a wonderful conversation piece when guests first arrive. The tall dresser is actually a piece from my childhood bedroom set that I use to hold all my crafting materials for so many different projects. The desk is really easy to rearrange so I can tuck away my machines to make space for card making, painting, printmaking and knitting (though honestly, most of the knitting takes place in front of Netflix!). I have inherited lots of notions (mainly zippers and trims) from both my Grandmothers, as well as a banker's box full of vintage patterns. They both sewed frequently throughout the years and I had access to many patterns, both commercial patterns and mail-order from the 60s & 70s (I may have opted out of taking the ones from the 80s...). I have a clear silhouette favourite as I look through them - the 60s shift. After binging on indie patterns in the last few years, I'd like to dip back into these older patterns more frequently, as there's always some new random trick you can learn. I like to sew in the late evenings, which is contrary to many seamstresses I know. When the sun is shining, I feel like a cat and either need to sit and soak it up, or go outside for a walk. 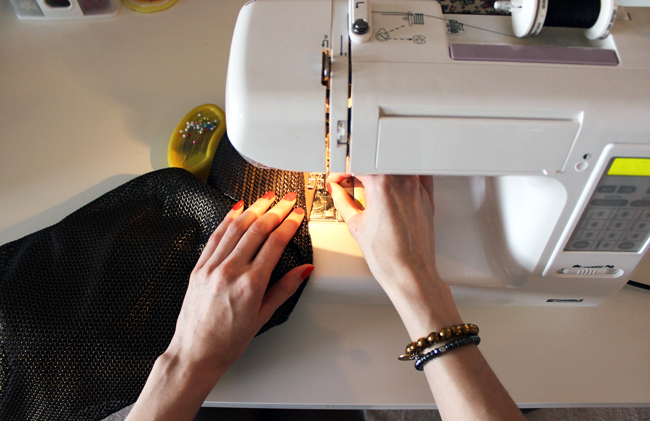 At night, everyone else is sleeping, everything is quiet and it's just me and my sewing machine. This works rather well for me - though occasionally I will hit a fiddly bit on a project and do it completely wrong because I've stayed up that touch too late! 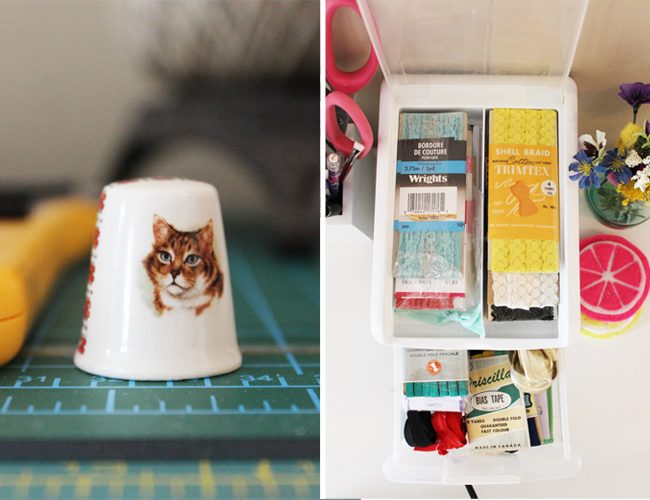 I've also really taken listening to podcasts while sewing recently, and my current favourite is the Gilmore Guys. I am grateful for this space, and how it allows me to jump into projects with little effort. You can bet I'll be here tonight, listening to the 'Guys, machine whirring away! Thank you for sharing your space with us, Katryna! We can't wait to see your Martha dress - if your fabulous Coco is anything to go by, we're sure to love it! 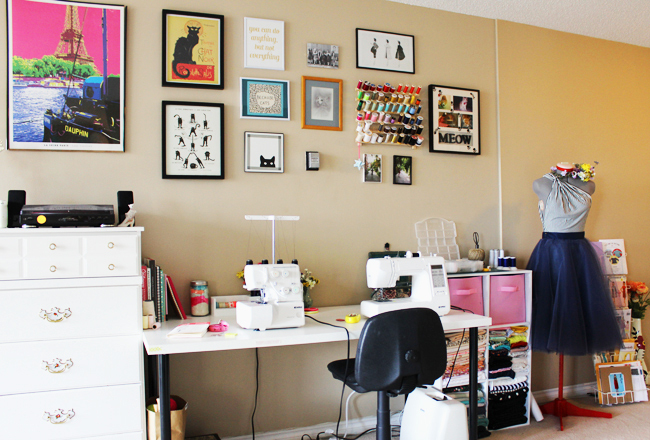 Did you catch the previous Sewing Space Tours - Lisa's yurt and Katie's spare room? Check them out, and find out how you can submit your space. Looking forward to seeing yours!